Vivian R. “Ginger” Bowers of Otsego, Michigan, passed away Monday, August 18, 2014 at her home. Mrs. Bowers was born March 18, 1934, in Munising, Michigan to Oscar and Eva (Barrow) Bray. For 20 years she was employed as cafeteria hostess at Parker-Hannifin Corp. In her leisure time Ginger enjoyed reading, baby sitting and time spent with her grandchildren and great grandchildren. Surviving are two daughters and two sons, Debra Bowers of Birmingham, AL, Dan (Sue) Bowers of Union, OH, Jeff Bowers of AL and Cindi (Harry) Brainard of Otsego; a daughter-in-law, Kim Bowers of Otsego; 16 grandchildren; 29 great-grandchildren; many nieces and nephews; and her companion of several years, Al Mullen. She was preceded in death by her husband, Ward Bowers in 1976; her daughter, Judy Esterline in 2000; her son, Craig in 2013; and 12 siblings. Cremation has taken place. 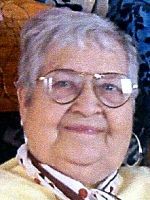 A Memorial Service will be held at 1:00 P.M. Friday, August 22, 2014, at the Winkel Funeral Home, Otsego, funeral celebrant Molly Wieber officiating. Contributions in memory of Vivian may be made to Fresenius Medical Care-Dialysis.